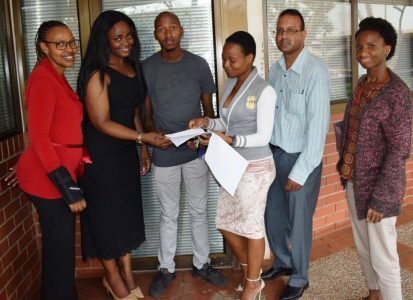 Almost 120 MUT post-graduate students felt the weight lifted off their shoulders on 2 April 2019 as they signed the bursary agreement forms with the Services Seta. Post-graduate students studying towards Advanced Diplomas in Human Resources Management, Office Management and Technology, Marketing, and B. Tech in Accounting will each receive R65 000 for tuition, allowances, books, residence, and transport. Sthembiso Gasela, an Advanced Diploma Office Management and Technology student, said he was very happy with the support he had signed for. The same was true with Sphesihle Shabangu, an Advanced Marketing student. Sphesihle said she was delighted her financial problems were sorted out. It is a blessing, she said. Cynthia Nkosi, the Senior Bursary Officer at MUT’s Financial Aid Office, said the more than R7 million that will be given to the students would go a long way in closing the gap since postgraduate students are not funded by NSFAS. “Now the students can breathe a sigh of relief and focus on their academic obligations. The financial help they are receiving from the Services Seta is likely to have a positive impact upon their academic performance,” said Cynthia.